Beth has been making waves in the 40+Community as her style, which she describes as Amercan classic with a modern twist, resonates with many 40+ women. Let’s find out more about her! Hmmmm, well, here goes. I’m a Midwest girl who traipsed around the world after my husband with three boys, two dogs, and one cat in tow. Now that my husband’s retired, and my children have flown the coop I woke up one day and decided I would write a book. No joke! And for those of you writers out there, you understand there’s a lot more to writing than coming up with creative ideas. As with anything in life it’s been a learning process for me these past few years: plot & structure, mechanics, conflict & suspense. Whew! It’s a daunting task at best. But I finished my first book, snagged an agent, then was rejected by all of the major publishing houses. Onward! Currently, I am finishing my second book, since forever, but hope to write The End soon. I recently turned 57! How that happened I have no idea – life just whizzes by. Can you tell us a bit more about your blog Style at a Certain Age and why you created it? My blog came about quite by accident after a complete stranger complimented me on my ‘style.’ It was then that I had an Ah Ha moment! Exactly like when I found the inspiration to write a book. I love fashion, always have. So I thought to myself, “this is it! I’m going to start a blog – I’m going to post a daily outfit.” And I did just that. I never really expected anything to come of it, but it’s been a fun and wild ride so far! I’ve also had such support from my family, and they love to tease me “oh, there goes style at a certain age.” My husband takes all of my photos, and my children cheer me on. They even chipped in to buy my husband a camera for his birthday last year after they noticed those early shots weren’t so crisp. I would describe my overall look as American Classic with a modern twist, which is true casualness at its heart. Nothing too fancy for me as I love clean lines that are oft times borrowed from menswear. I’m happiest when I don a pair of blue jeans and top it off with a sweater. And I’m a total sucker for pearls, charm bracelets, and a classic watch. I’d have to say I couldn’t live without my blue jeans. But accessories punch up my style in no time flat: scarves, belts, hats, baubles, and shoes. A fabulous haircut is money well spent, and is truly your best accessory. I don’t know what I would do without my stylist’s keen hand with a pair of scissors. San Francisco and its microclimate have taught me how to layer-up! I think the scarf craze was born in the Bay out of necessity – staying warm while looking stylish. And I have to say that California has a laid-back fashion sense, which is perfect for this casual chic girl. I favor blazers and blue jeans. When in doubt, I reach for these go-to items, and jazz them up with a pair of heels and a pop of color from my handbag. It’s important to dress for the occasion. We all lead such busy lives: we drive carpool, jet off to vacation, attend graduations and weddings, head off to work each day. When I’m getting ready in the morning I factor in “where am I going?” And I try to showcase a variety of outfits on the blog that answers that question. If I’m off to a power lunch I’m going to sport a conservative suit. Or if I’m taking our dog, Oscar, off for a long walk I’ll most likely be seen in a pair of flats and blue jeans. I definitely favor certain colors that compliment my skin tone: pinks and corals or greens and blues. Keeping proportion in mind is so important when fine-tuning an outfit. It can make or break a look. The devil is in the details so I try to remember this when putting an ensemble together. I’ve always been a prepster at heart so nowadays it’s more about fine tuning that look, and keeping it fresh. For those readers not familiar with American slang the ‘preppy’ look is defined by stripes and colors, equestrian clothing, plaid shirts, field jackets, and nautical-themed accessories. The overall look is rooted in the classics: blazers, chinos, crew neck sweaters, and button-down shirts. Think Ralph Lauren, JCrew, L.L. Bean or Lilly Pulitzer. Age appropriate rules were best reserved for my mother’s generation that didn’t allow white after Labor Day or insisted your shoes matched your purse. And bare legs? Never. Thank goodness those barriers have been struck down, and all for the better. I’m a firm believer in dressing appropriately for the occasion no matter what the age. There may be certain styles I don’t particularly favor, but there’s been far too much negativity on what women ‘can or can’t’ wear. Who made up those silly rules to begin with? I’m all about empowering women, and their choices. I’ll leave the nit picking to others. I love fashion just as much today as when I was a teenager flipping through my favorite magazine “Seventeen.” There’s just something about the aesthetics – the colors, the cut, the fabric. But what I love most about fashion is that you don’t have to have a lot of money to look great! Which is just as important today as years gone by. There’s a definite connection between looking good and feeling good. Personal style is your calling card to the world. Sometimes, it’s your first and only impression. Make it count! That’s a good question. 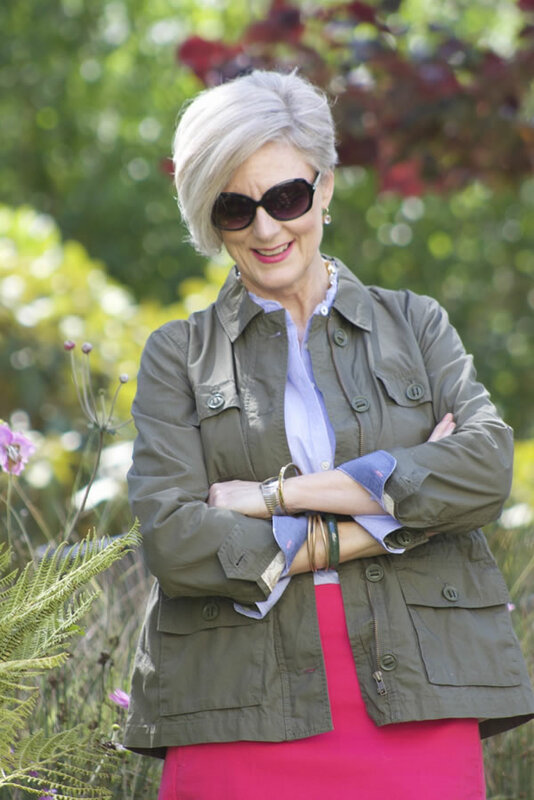 The tagline for my blog is ‘trends come and go, but true style is ageless.’ I love it when a trend is trending again like jean jackets, which I wear often year-in and year-out. I think I’m on my third go-round with overalls. So I do follow trends, but don’t chase them. As for fashion and style tips for the over 40 crowd, what I can share with you is this: I can’t tell you how many emails I’ve received from women in their teens and twenties that thank me for being a role model on how to age gracefully. So my advice is this: don’t fear aging, instead let’s embrace it. Let’s be authentic, let’s be genuine, let’s find new adventures to embark upon, if we do – then we’ll truly be beautiful inside and out, and it doesn’t hurt to add a little lipstick before we head out the door. When I started this whole adventure I never dreamed I would have more than a handful of women paying attention. I was just pretty darn proud of myself for regularly pulling an outfit together, and posting five days a week. But, I don’t think the blog will shift its focus from outfits of the day. It’s important to find your niche, and stay focused. Readers like consistency. And hopefully, I’ve done just that in my own way, one outfit at a time. Thank you, Sylvia, for reaching out to me! I love your blog. You’ve done an outstanding job connecting so many women from around the world to each other, and in the process given them great style tips and advice. That’s a job well done. 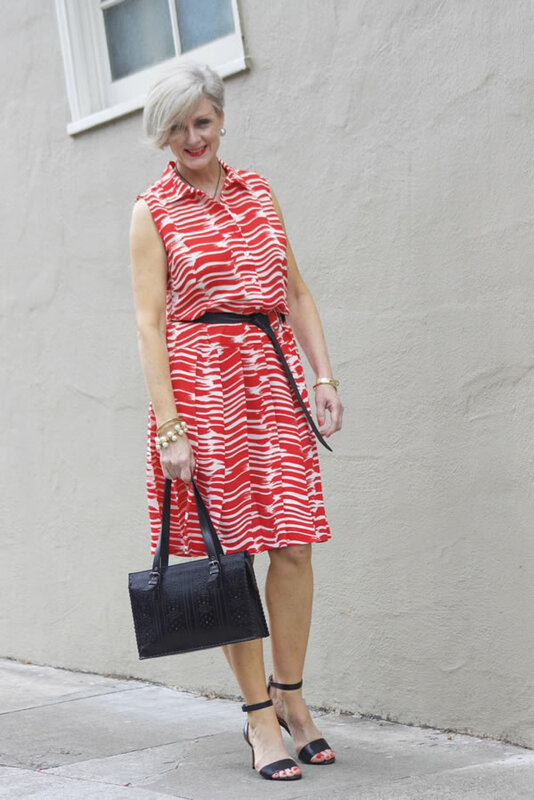 For many more inspiring looks be sure to check out her website Style at a Certain Age or her Instagram. Which is your favorite outfit of Beth? Great article! Beth looks fabulous in all of her outfits, but I am definitely keen on the picture with her beautiful dog (of course! ), and her other photos where she dresses her jeans up a notch. 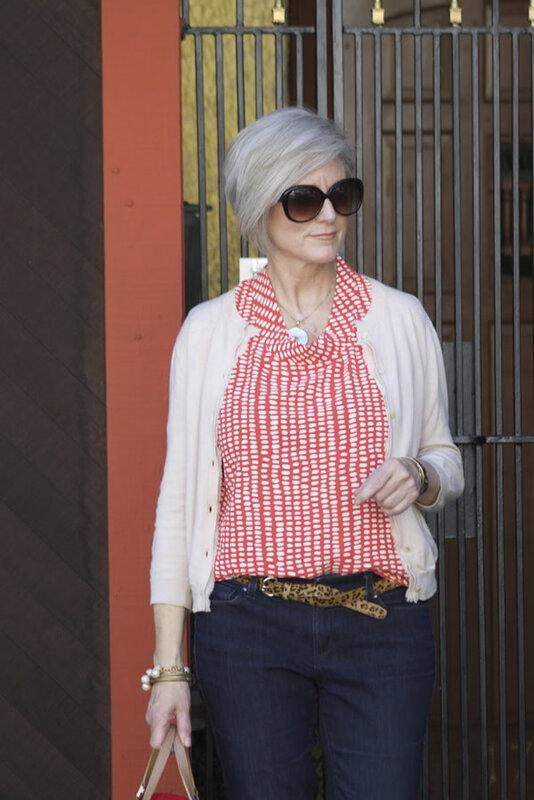 I especially like the orange/red and white patterned blouse and cardigan with jeans. I also like the variety in her wardrobe. She seems at ease and perfectly natural in everything. Great interview as always, I love the range of looks and colors that Beth styles in such modern and fresh ways. Thank you for another great interview, Sylvia. It was funny to read Beth describe what “preppy” style is, too, as my daughter asked me the other day what it meant. Having grown up with that word and “The Preppy Handbook” I could not believe that she had never heard it! Oh that last picture threw me. Nice but I prefer her recent edgier haircut. This lady is not only very stylish, she also has a good figure, great hair, perfect legs and a beautiful face. I mean… some have it all. Love it. Wise and beautiful woman, inside and out! The mustard yellow outfit with a striped blazer is my favorite, along with the red dress. Thank you for yet another great interview, Sylvia! You do stellar work, Sylvia. Another brilliant interview with a brilliant blogger. 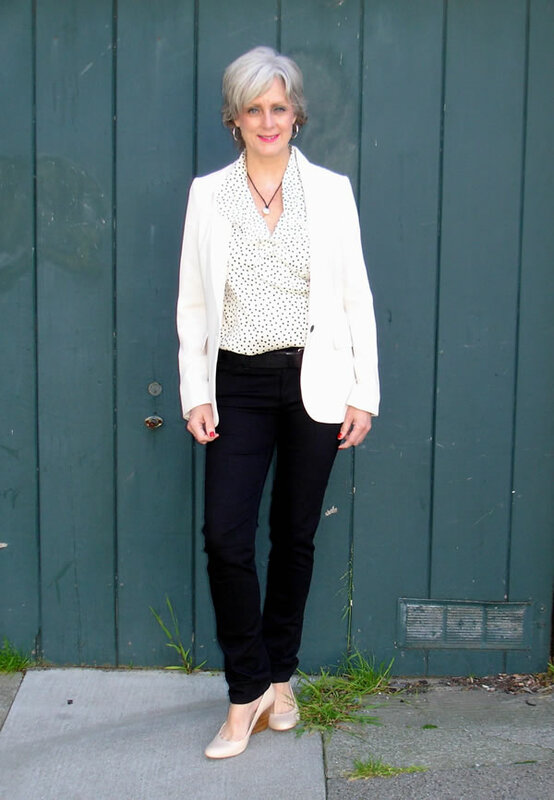 Love Beth’s style – the whole shebang. A beautiful, intelligent woman with a beautiful, intelligent dog. Keep ’em comin’ … you are amazing. Another wonderful interview Sylvia. Beth has great style, a killer haircut and a terrific attitude. Aging is nothing to fear as you’ve shown with other blogger interviews. It’s all about attitude, confidence, insight and lots of style. what lovely comments from such lovely ladies! a big thank you to each of you for taking the the time to write down your thoughts. it is so appreciated. Great interview! I enjoyed reading her story. Beth,looks great in all of her outfits. I especially loved the red dress and that green pleated skirt..
Like Beth’s style overall … favorite outfit is the monochromatic mustard pants and shirt with the black and white striped jacket and the oversize beads …. love her hair cut also.. Thank you for sharing this interview with Beth. I love her style and how she achieves her looks. I’m also a big fan of classic with a twist! people are not always able to transition from the -teen-age to -ty-age. Thank you so much for inspiring me how to express my ‘self’ in my 40-ies !!! Previous post: Fabulous style at the New York blogger meetup!